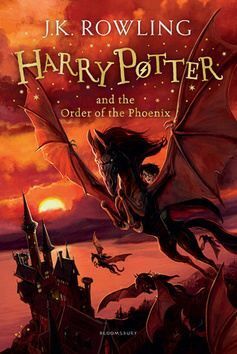 Harry Potter and the Order of the Phoenix 5 - Joanne K. Rowlingová Dark times have come to Hogwarts. After the Dementors' attack on his cousin Dudley, Harry Potter knows that Voldemort will stop at nothing to find him. There are many who deny the Dark Lord's return, but Harry is not alone: a secret order gathers at ...a dál? Harry Potter and the Or..
Produkt J. K. Rowling: Harry Potter and the Order of the Phoenix neprodává žádný obchod s kamennou pobočkou. Zobrazte si všechny obchody nebo zkuste podobné produkty. Produkt J. K. Rowling: Harry Potter and the Order of the Phoenix nemá žádný obchod skladem. Zobrazte si všechny obchody nebo zkuste podobné produkty. Produkt J. K. Rowling: Harry Potter and the Order of the Phoenix neprodává žádný obchod s možností platby kartou. Zobrazte si všechny obchody nebo zkuste podobné produkty. Harry Potter and the Order of the Phoenix - Rowlingová J. K.
Harry Potter and the Order of the Phoenix – Rowling J. K.
Pátý díl oblíbeného fantasy příběhu o Harrym Potterovi a jeho přátelích. Kniha je v angličtině. Dark times have come to Hogwarts. After the Dementors attack on his cousin Dudley, Harry Potter knows that Voldemort will stop at nothing to find him. There are many who deny the Dark Lord s return, but Harry is not alone: a secret order gathers at Grimmauld Place to fight against the Dark forces. Harry must allow Professor Snape to teach him how to protect himself from Voldemort s savage assaults on his mind. But they » ... a dál?